The first picture was taken in 1980 by A. Biedrin. It is a scan of the photo of the memorial in the file on the Stučka file at the Piemineklu dokumentacijas centrs (Klostera iela 5/7, Riga, LV-1050) in Riga. This memorial was removed during the "awakening," probably in late August of 1991, around the same time the Lenin statue was removed from near down town. The other pictures were taken on 1 September, 2007 at the same location. 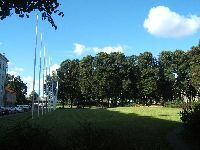 They show the empty square as it appears today. 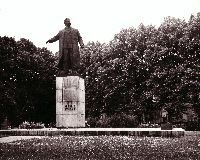 Before the Stučka statue was there, the location had been empty since the 1930s. From 1817 until then, a 14.8 meter high "Victory Column" commemorating the victory over Napoleon had stood there. The metal parts had been evacuated to Russia in 1915 and the rest taken down in 1938.